How do you stop an elephant from charging? Take away its credit card. 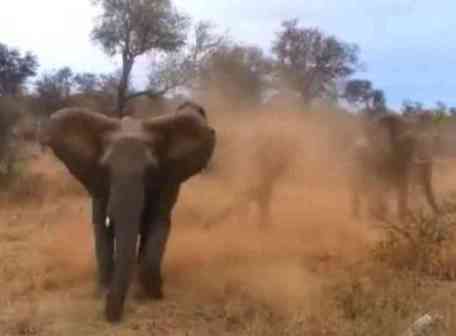 charged by an elephant has turned up on the Internet and is going viral. The video was shot by safari guide Johann Lombard in South Africa's Kruger National Park. 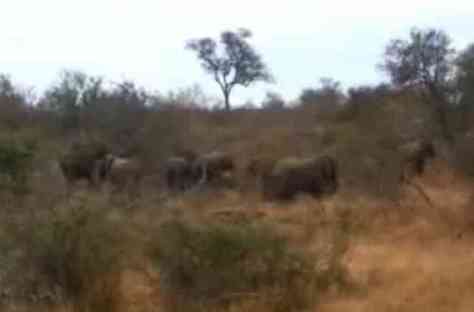 Lombard calls out to the elephants to reassure them that they are not predators. The first two heading for the jeep stop. 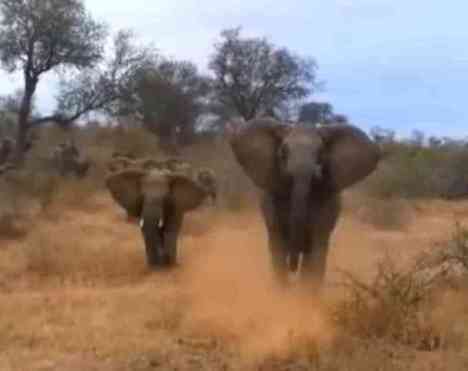 The guide continues to speak to them in a loud but reassuring voice when suddenly a third elephant charges past the other two and makes a direct hit on the jeep. The vehicle is turned on its side almost instantly. By the time the shaken, but apparently unhurt, humans resurface the elephants have gone back to their grazing and looking as gentle as they are generally known for being. So was it a case of elephant road rage? It is hard to say just what really set the pachyderm off. About 500 people a year are killed in elephant charges. This statistic includes both wild and captive elephants. twitching trunk and the swinging of one leg back and forth. to make mock charge out of fear. If the animal's ears are laid back against its head their threat is real. At this point the trunk is often tucked under. You may also hear trumpeting noises from the animal as an additional warning. Should you find yourself the focus or an irrate elephant there are things you can try to dissuade them from continuing. During a mock charge standing absolutely still can stop the animal. However, this is very difficult to do with something that large coming at you. What experts suggest is making as much noise as you can. Shout, scream, or rattle the bushes. This also works best with a mock charge. The noise and movement lets them know that you are not moving like a predator. Whatever you do, don't turn and run. This encourages a chase. If you run try to find something large to duck The Aftermath -- Like Nothing Happened (You Tube Image)behind -- a building, vehicle, or tree. You can also run in a serpentine pattern to confuse the elephant. Their size makes it difficult to change directions. Of course, if there is a group of people you only have to run faster than someone else. While this is often used as a joke, it is true. It's not what most people want to think about and you do want to get everyone to safety. If you have the breath shout instructions to the others. You can climb a tree but it needs to be a really big tree. While they can't climb, they can reach with their trunks or just rip the tree down. Some people have also escaped by throwing themselves in a ditch, however the ditch needs be large enough and deep enough so that the beast can't reach you with its trunk. If an elephant does catch up with you, try throwing a decoy. A hat or jacket tossed some distance away can lead the animal in a different direction. You can also resort to the noise idea again. You can try playing dead, hoping that the animal will lose interest, but you run the risk of being stepped on. If you and your companions survive, check to make sure everyone is okay and get treatment for injuries immediately. Also inform local park rangers, keepers, or police of the incident. Lombard, a 23 year veteran of guiding visitors through the park, reported that neither humans nor elephants were injured. He also said that having an elephant charge a vehicle like this is extremely rare. Do Elephants Sing In The Rain? You Decide! Help! I'm Stuck! The Animal Video Of The Day!!! Are These Elephants Fighting? The Animal Video Of The Day!! !